This romance novel, first published in 1996 and now re-released with a second novel, is set in Regency England and features a klutzy but warm hearted young woman named Cora Downes. Not entirely low born, as the daughter of a well off Bristol merchant she barely registers on the radar of the infamous ton until she accidentally rescues the grandson of the Duchess of Bridgewater from drowning. The duchess is so grateful to Cora that she takes her to London as her protege with the intent of marrying her off to a man of high society. Cora’s awkwardness is often remarked upon by her brother with exasperation but when she finds herself surrounded by titles, her clumsiness level ramps up to mach 5 and she finds herself tripping over her own to feet at a ball and landing squarely in the arms of Lord Francis Kneller. Luckily for Cora, Francis is a good friend of the Duke of Bridgewater and had been asked to help make her appear more appealing to her potential suitors. At first Lord Kneller simply finds Cora amusing but eventually that amusement becomes something more. I won’t give away the whole story but this book wasn’t half bad. I wasn’t crazy about how ditzy the heroine was but I think explaining it away throughout the book as an abject fear of the aristocracy made it work. Even I was able to forgive poor Cora’s moments of stupidity and you really can’t help but love the woman. I also wouldn’t have thought of Francis as being the hero but once again, his effeminate nature is addressed throughout the story and my only disappointment was that there weren’t more instances of him showing more of a masculine side, especially when he found out she’d thought he was gay. 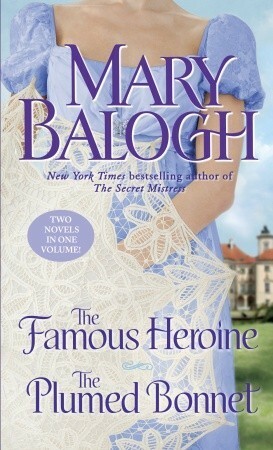 Still I found The Famous Heroine to be an enjoyable and satisfying read with humorous and likable characters and I intend to search out more of Mary Balogh’s work.